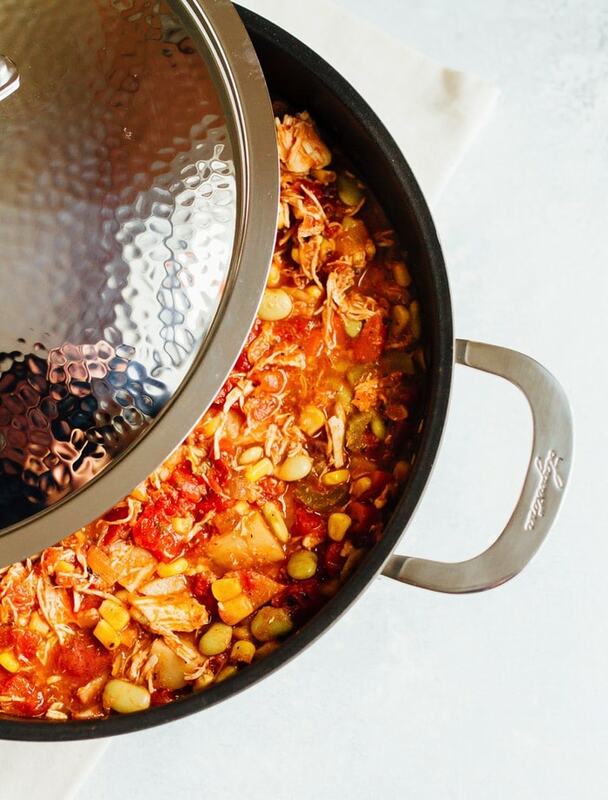 This healthy Brunswick stew is just like the southern classic, but made with simple and wholesome ingredients — no ketchup or bbq sauce needed! Recipe made in partnership with Lagostina and Macy’s. I received Lagostina product in order to create this post, but as always opinions are my own. 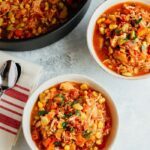 Brunswick stew is a Virginia classic, but it isn’t something I grew up eating. I was first introduced to the thick stew when I met Isaac in college. He and his roommates loved Mrs. Fearnow’s and they would stock up whenever it was on sale. Truth be told, Isaac still likes it and there’s a can in our pantry right now. 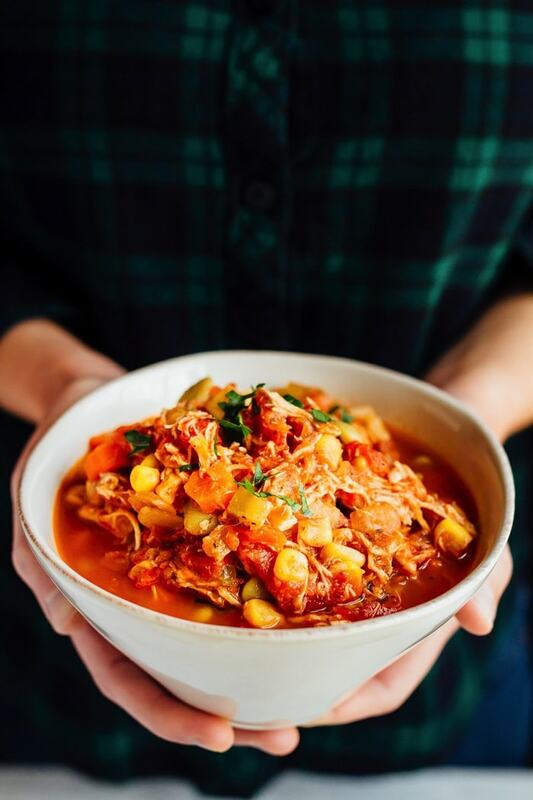 Staring into the pantry one night I saw the yellow can and finally decided I needed to make a homemade healthy Brunswick stew for him. After a little research I found that Brunswick stew likely originated in Brunswick, Virginia during the 19th century and it was originally made with squirrel meat. I looked at a couple recipes online for inspiration, but ultimately ended up using the ingredient list from a can of Mrs. Fearnow’s as my guide because it’s short and overall pretty wholesome. Some of the recipes online called for cups of ketchup, chili sauce, bbq sauce and creamed corn. I’m not a fan of using a ton of packaged products (because they usually have a lot of added sugar and preservatives) so this recipe skips those things. The only packaged sauces you’ll need are worcestershire and hot sauce. Although if you decide you want to add a little bbq sauce, you can use my homemade healthy bbq sauce recipe. To cook up the stew, I used a new Lagostina 5-quart casserole pan from Macy’s that I was sent to review. It worked great, providing even heat distribution and a non-stick coating for easy cooking and clean-up. The flared edges allowed for dripless pouring when transferring the leftover stew into a storage container and the pan is dishwasher safe so I was able to toss it right into the dishwasher after dinner. 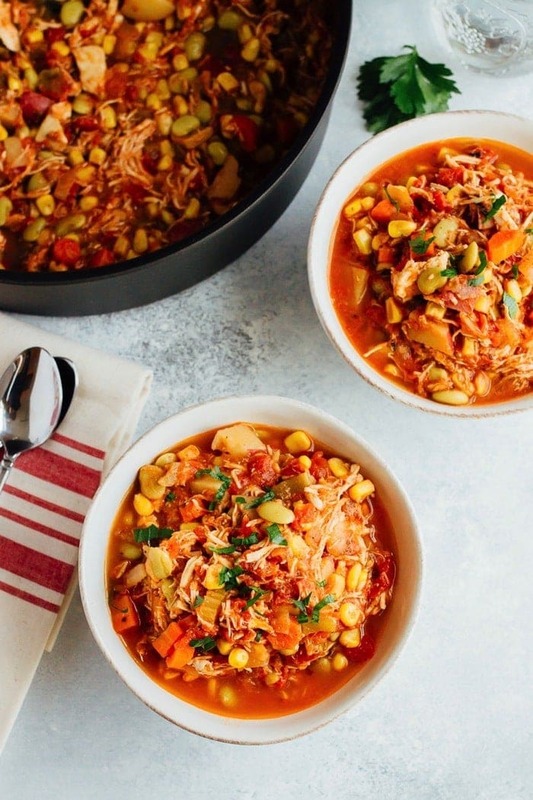 I know it’s technically spring, but if you’re looking for one last warm and comforting meal before you start gearing up for light and cooling spring meals, I highly recommend making a batch of this healthy Brunswick stew. It’s loaded with flavor and truly something the whole family will enjoy! As you’ll notice, the recipe calls for cooked shredded chicken. I did this purposefully so that you’re able to use up leftover shredded chicken you already have on hand, but you can also make a quick batch or use shredded chicken from a store-bought or homemade rotisserie chicken. Any and all of the above will work! A healthy version of the southern classic loaded with and shredded chicken. Heat oil over medium heat in a large casserole pan/dutch oven. Add onion and garlic to the pan and sauté until fragrant and soft. Add in carrots, celery and potatoes, canned tomatoes, broth, corn, lima beans, worcestershire sauce, parsley, bay leaf, salt, pepper and hot sauce. Bring mixture to a boil, then reduce heat simmer for 30-45 minutes or until potatoes are tender. Stir occasionally. Remove bay leaf and add in shredded chicken, stir to combine and cook an additional 5 minutes or until chicken is heated through. If stew seems too thin, you can mash up some of the potatoes with a fork to create a thicker broth. If the stew is too thick, you can add more chicken broth or water, starting with 1/2 cup. Once stew is ready to serve, place in bowls and garnish with fresh parsley. Serve with hot sauce so everyone can add as much or as little spice as they like. 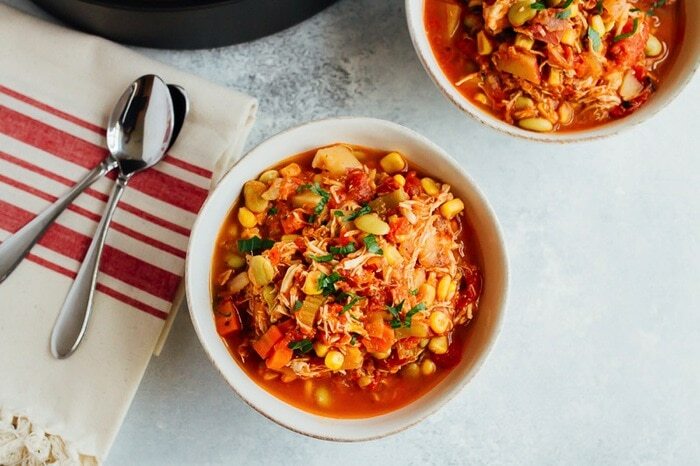 My favorite family recipe is without question, “Friendship Soup!” Many years ago, when I was a child, one day my mom told my family and I we would be having Friendship Soup and asked if I’d like to help. It was a recipe passed down to my mom by her mom (my grandmother) which simply involves a very large sampling of fresh vegetables, spices and herbs in a thick, tomato-based broth. It might seem simple, but it was heartwarming and fun to be able to prepare and enjoy it together. My favorite family recipe is Stuffed Zucchini – vibrant and nourishing. My kids get so excited when it’s Loaded Baked Potato Soup night. One of my favorites is Frittata. It’s easy to make & you can use different ingredients and change it up each time you make it. My husband likes it with prosciutto, smoked paprika, cheddar cheese and chives. My favorite family recipe is sweet corn soup. It reminds me of my great grandma who used to make it for me whenever I visited her! My favorite family recipe is stuffed peppers! So easy and delicious and you can really eat the rainbow! The stew recipe looks fabulous! 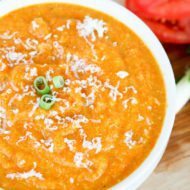 I think I’ll try it with sweet potatoes! I love that you aim to not use any processed ingredients! Thank you! I love brunswick stew! It was very interesting to learn where the name came from. We love it down here in NC with our famous BBQ! My favorite family recipe is my mom’s chicken and pastry that she makes in a flash using a pressure cooker. This looks delicious! My favorite family recipe is my great grandmother’s macaroni & cheese. It’s so decadent that it is a holiday-only dish 🙂 but it’s something’s I look forward to in holidays! My favorite family recipe is pumpkin-beef curry. The beef provides a hearty meat taste and the pumpkin adds the sweet texture to the curry. Love it! And this meal looks good, I might prepare it during a school break ???????? I can’t give this recipe five stars for some reason on an iPhone. My fav family recipe is tourlou. It’s a greek dish. You basically throw green beans, tomatoes, eggplant, potatoes, a ton of garlic and some oregano in a roasting dish and cook it for a long time – the house will smell amazing! I have never made Brunswick stew. My first time sampling it was at the VA State Fair years ago. Your recipe looks so amazing that I will have to try making it soon! My favorite family recipe is baked beans my mom used to make. I make them and now my daughter makes them. It is just pork and beans, onion, brown sugar, tomato sauce and bacon. My favorite recipe is my dad’s black bean stew. It’s so delicious and nourishing. My most cherished memory was coming home from school to a traditional German menu of sauerkraut and bratwurst with a side of thickly sliced rye bread and European butter. Since her passing I’ve tried to uphold this tradition! My favorite family recipe is strawberry bread. Every Father’s day we would go strawberry picking then go home and make the bread and fresh strawberry jam. After I left the nest, my mom would send me care packages at college with some and my roommates would love it! My favorite family recipe is Shrimp & Grits. It is an all time family favorite. It is especially requested at family gatherings and tops the list for our family Christmas Brunch. It is all the warmth and love in one dish!! Oh my goodness this is most defiantly going to be my new favorite recipe now.thanks so very much for sharing. My family favorite is my grandma’s brownies which no one has been able to perfect since my grandma passed away with the special touch. We also love the many dessert recipes passed on through the years. A delicious sweet potato chicken stew with popovers and is a family favorite meal! My favorite family recipe is my mom’s Beef barley soup with meatballs and veggies! SOOOO YUMMY!!! I think I may have made ‘Quick Beef and Bean Chili’ a few hundred times by now. It truly is quick and easy, but time after time it gets rave reviews. It originally came from a Cook’s Country magazine, and the recipe card is well worn. Beef (or ground turkey or crumbled meatballs or chicken sausages), beans, tomatoes, and chili powder, cumin, garlic. Totally satisfying. Perfect with a bit of plain yogurt and avocado on top…and perfect, I bet, for this lovely casserole dish you’re giving away! I think I may have made ‘Quick Beef and Bean Chili’ a few hundred times by now. It truly is quick, but time after time it gets rave reviews. It originally came from a Cook’s Country magazine, and the recipe card is well worn. Beef (or ground turkey or crumbled meatballs or chicken sausages), beans, tomatoes, and chili powder, cumin, garlic. Totally satisfying. Perfect with a bit of plain yogurt and avocado on top…and perfect, I bet, for this lovely casserole dish you’re giving away! My favorite recipe is tuna pasta casserole, it is a family favorite. My favorite family recipe is loaded potato soup. Definitely not the healthiest, but when the first snow hits each winter I HAVE to make a batch. My favorite family recipe is my grandmother’s roast beef with carrots and potatoes. It’s so good and reminds me of my grandmother everytime I make it. Thanks for sharing with us. I love my Dad’s vegetable beef soup, but if we’re going with traditional family dishes — it’s gotta be Ebleskiver! My Dad’s family always puts brown sugar and raisins in our version. 🙂 I was also pretty peeved when they came out with ‘puff pancakes’, which is the exact same thing — but they don’t give the original culture (Danish) any credit for a ‘new’ idea! Oh man, it’s hard to pick a favorite! I always loved my mom’s hashbrown casserole at the holidays. Very nostalgic. This recipe looks awesome! One of our favorite family meals is lasagna. My favorite recipe is called Buttons. It’s basically German dumplings. This sounds so funny, but my dad’s mashed potatoes! As always, your pictures and recipes inspire me to hurry home to the kitchen and make the dish you have posted! Can’t wait to try this one, too! It is hard to pick one favorite family recipe! I love my Mom’s Waldorf Salad as she always makes it for me on special occasions or when she wants me to know that I am special on any day! (Love-Love) Her version is made very healthy compared to the traditional recipe with more fruit and no whip cream! However, our Granny’s Spaghetti Salad ranks up there as well. I tried her recipe with zucchini noodles and it was fabulous! Ohhh!!! Will you send me Granny’s recipe for spaghetti salad? I want to try it with zucchini noodles too!! 🙂 🙂 Her strawberry pretzel salad was already my favorite too! Just had a chance to get back on my computer. Took a break over the weekend! 🙂 Will send the recipe to you. I have it in my book at home. I loved her pretzel salad, too. Please share it with me as I don’t have it! Love you! A cherished family recipe of mine is Swedish Rye Bread! The recipe takes only a hefty 8 hours from start to baked perfection finish, but the wait is always worth it! I learned the recipe from my mother, who had the recipe passed down to her from my great-grandmother. Needless to say this bread has been well loved in my family for years ???? lasagna from scratch–it’s every single member’s favorite! My dad makes the best chili and it’s always a meal I request when I get to go home and visit. I’ve tried to recreate it, but it isn’t quite the same without the whole family around the table! My favorite recipe is my best friend’s Lentil Soup. You can use either shredded chicken or lean ground beef or turkey or bison if in an area you have access to it. It has a lot of fiber and you stay full. Our family fave is a spicy shrimp and portabello penne dish that I make. Fav family recipe has to be pork and chive dumplings! It’s always a fun time when everybody stands around the kitchen counter wrapping the dumplings and chatting. My favorite family recipe is baked ziti. My family loves my cast iron whole roasted chicken! Our favorite family recipe would be scalloped potatoes and ham. I would love to win. My favorite recipe is my mom’s monster cookies. I got in trouble when I was young for sneaking so many at Christmas to eat. We all still love them 30 years later! 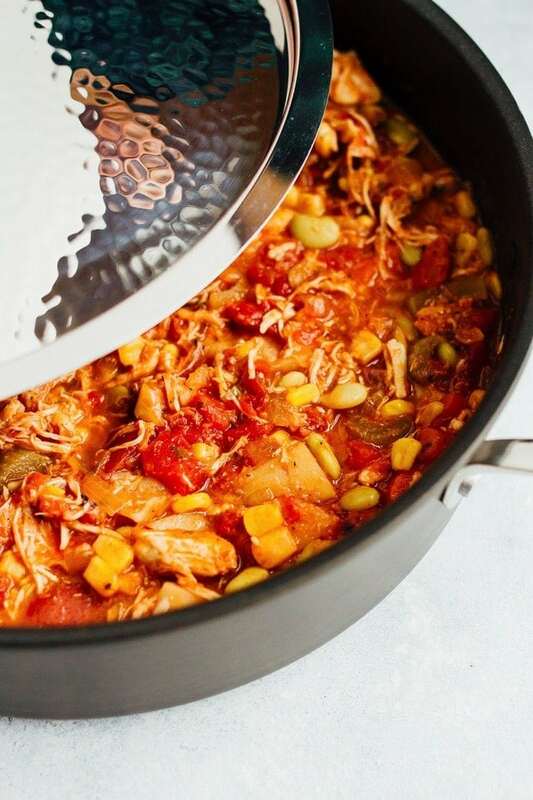 I love making shredded chicken in the crockpot! BBQ and Mexican are our faves at the moment! My favorite family recipe is hot pot – it’s not really a recipe per se but an experience! We would all gather around the electric hot pot at the table and add in different vegetables, noodles, and meat… and eat! 🙂 It’s sort of an Asian thing (Korean) but lot’s of fun and very comforting during colder months. My favorite family recipe is my grandmother’s beef vegetable soup. It is so thick and comforting. every time I make it, it evokes fond memories of time I spent with her. My favorite family recipe is my mom’s lasagna. It is a classic for us that we always make when cooking for a crowd or bringing a meal to a family friend. Our favorite family recipe is chicken stir fry with delicious vegetables. I can’t wait to try this recipe. It looks so delicious and healthy. Thank you for sharing. My mother-in-law makes an amazing beef stroganoff! I can’t get enough of it! 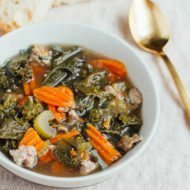 Omen of my favorites is my dad’s Italian Wedding soup- reminds me of Sunday dinners with my family! My favorite family recipe is chocolate mistake cake! It involves wayyyy too much chocolate and chocolate cream cheese frosting and we have it at all of our family birthday and special occasion celebrations. Gumbo! It’s welcome in our house year round. My mother’s potato salad is the best. She won’t tell me her secret ingredient!! That soup looks delicious! My fav family recipe is a salmon dish that my mom makes with a simple sauce made with soy sauce(or tamari), sesame oil, vinegar, honey, ginger, and red chili flakes. 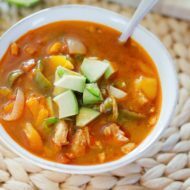 My favorite family recipe is white chicken chili! Our favorite family recipe is linguine with clam sauce. My favorite family recipe is a cookie recipe for the holidays that my grandmother used to make. It’s a cinnamon bar, but we used to all them Ralph cookies after my dad because he ate so many. our family favorite meal is our spinach artichoke soup because it so rich and creamy. Favorite family recipe?? Hmmmm…I’d have to say it’s homemade green beans with bacon. Now that I’m health conscientious, I tried to use turkey bacon but it was almost an insult to this classic homemade recipe. I love this one you posted! Can’t wait to try it! I am super sad to say that I do not have a favorite family dish 🙁 my parents rarely made things from scratch or using a grandmother’s recipe or whatnot. And I am not a very good cook myself, so I can’t even say that I’ve made anything “family recipe/dinner” worthy! But that’s my goal for this year and years to come – to learn how to cook more and to actually have a disengaged family recipe night! My favorite “new” family recipe is taco salad! My family just chops fresh vegetables, cooks some form of protein, and tops it off with fresh avocado and salsa! It is simple, but so good every time! But, my favorite family recipe that has been passed down is definitely homemade dumplings! My favorite family recipe is chocolate syrup and biscuits. I love my family’s Seven Layer Salad recipe! My family loves black beans quesadillas. My famous homemade zucchini bread! Ohh!!! I bet your zucchini bread is delicious. Potatoes and cabbage is a great one. Cook bacon and onion in a large pot, cut golden yukon potatoes in half and toss in the pot. Thinly cut cabbage and fill the pot with it. Pour in a can of chicken broth, bring to a boil, cover and bring down to a simmer. COok for around 20 mins. My favorite family recipe is my dad’s pancakes! My favorite family recipe is a delicious Chicken Cacciatore! My favorite family recipe is Stuffed Cabbage, looks like I’m not the only pol here. My familys favorite recipe is pot roast. My family’s favorite meal is my Grandmother’s Easter ham with Corn Pudding! my favorite recipe is chicken pot pies! We love baked yams stuffed with either carnitas or carne asada, and black beans, salsa, cheese and avocado. EXCELLENT! I cooked the Brunswick Stew last night as instructed with two modifications. Instead of boxed broth, I slow-boiled 3 lbs chicken thighs in 5 cups of water and used the broth from that. I also used 2 Bay leaves. My husband and I both loved it. Thank you so much. The recipe for this sounds great except for the Lima beans. Any suggestions on another type of legume I could sub in? Hi Anne! I think cannellini beans would be great instead of the lima beans. I hope you get a chance to try the recipe.